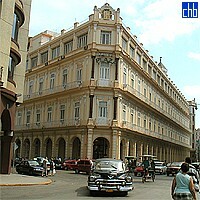 A very attractive four-storey early twentieth century building, restored and reopened in 1991, well located for sightseeing in Old Havana and Centro Havana, and particularly for visiting the Capitolio, the Museo de Bellas Artes, the Gran Teatro de La Habana and the Museo de la Revolución. 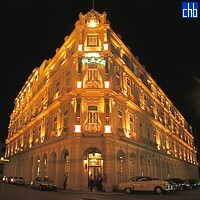 The Plaza is a rather curious triangular building, but its lobby and bar with a central fountain and lots of singing birds are very atmospheric and the roof terrace has excellent views of the area, particularly of the Bacardi Building. Although most staff are professional and friendly, sadly the same can not be said over the last years of the doormen and security guards. The later are infamous for being unnecessarily scary and plain rude. 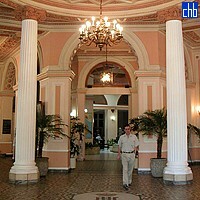 But please be reassured this is not typical of any other hotel in Cuba. 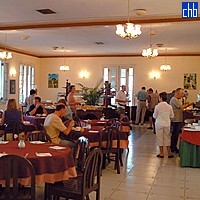 The Plaza’s standard rooms are of varying sizes but they are all very pleasant with cream-coloured walls, terracotta tiled floors and wooden furniture. They walls are hung with prints - often very good woodcuts – by local artists. 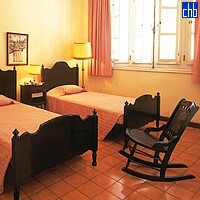 The beds and wooden chairs with rush seats are comfortable and some rooms have colonial style rocking chairs. The bathrooms are tiled in gleaming white from floor to ceiling and are very clean. The windows have wooden shutters which can be closed against the sun during the hottest part of the day. 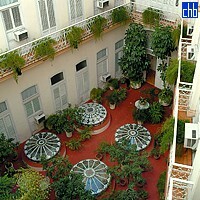 The rooms facing outwards to the street, rather than into the courtyard, are the most spacious.